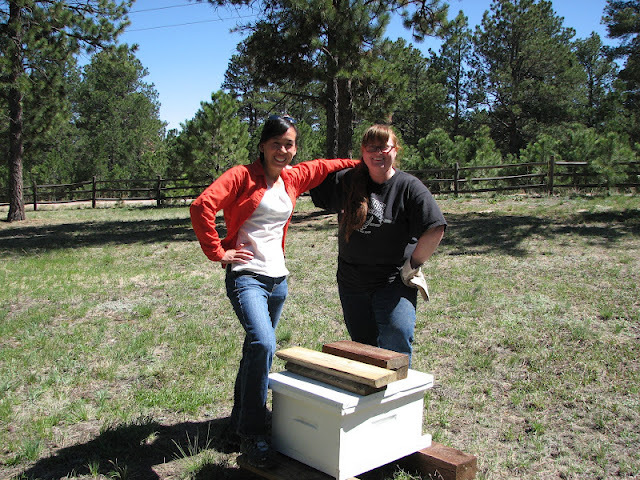 My friend Sarah and I are beekeepers. It's totally official, because we just installed our first package of bees today. That means that we took a 3lb package, containing about 10,000 bees, and dumped it into our very first hive. Actually, dumped is pretty mild. It's more like we thumped, whacked, banged, and shook those girls into the hive as hard as we could. They really wanted to stay in the box. We'd done our research. I've taken the Beekeeping for Beginners class offered through our local Beekeeping Association. I've Googled and YouTubed the subject to death. (I'm positive I'm now on some Prepper watch list somewhere because I watched a lot of videos made by Survival Report and Doomsday Productions. What can I say, they've got informative videos on how to start a beehive.) Every video I watched on installing a package of bees said to 'thump and dump' into the hive. Maybe a few more thumps to get them into a ball in the corner, then dump again. Apparently my bees didn't get that memo. The first cluster dumped out OK, but then the rest refused to clump or go where I thumped them. We ended up pulling off the screen on one side to get the majority dumped out. The queen is marked (totally worth the extra $2), yellow for 2012, and I'm hoping this will make her easier for a pair of newby beekeepers to spot. We popped the cork and wedged the queen cage between 2 frames. There were already several bees clinging to the outside of her cage, so hopefully there won't be any problems with them accepting her quickly. We setup the 1:1 (or kinda close) sugar water solution in the entrance feeder, added the entrance reducer, and closed the top up. The feeder was leaking (maybe the punched holes are too big? ), but hopefully it slows down and doesn't drown the bees. We set up a 5gal chicken waterer with gravel around the rim to provide a water source for the bees. There's nothing noticeably close, and bees need water. We left the package in front of the hive for the remaining bees to find their way home, and then we stepped back and appreciated our new girls. Sarah and I have been talking about getting some bees for a few years now. I garden, and every time I'm out there with a feather pollinating by hand I wish we had more local pollinators. If I don't help pollinate, my cucumber, pumpkin, strawberry and pea production is low. Pollinators increase production in a garden. I'd love to leave it to nature, but I live on the high plains of Colorado. More specifically, on the east side of Colorado Springs. Which means a lot of new construction in recent years, with a lot of what the developers call "xeriscaping" and I call rocks. There's just not enough plants blooming at once throughout the summer to draw back many of the native pollinators. Hence my attraction to having a beehive. Plus, who doesn't love honey? I have hayfever, and like to buy honey local to the area (I don't care if it's not scientifically proven to help or not). Wouldn't it be even better if I produced MY OWN honey? That's what I thought! Talking with my friend Sarah, turned out she'd thought of having her own hive too. The more we researched, and found out about colony collapse disorder, and how every third bite was produced with the help of bees, how native pollinators were being destroyed by pesticides, the more we really wanted to do this. We figured going in together would be easier, and we could split the mistakes and the work involved. First we had to find a location to put the hive. Turns out my DH is afraid of bees (that's right, I called you out), and didn't want the hive in our yard. (You remember one of the big reasons I wanted bees was to pollinate my garden, right? So much for that idea.) Sarah lives in a nice area for bees, with established landscaping, open areas, and a community garden. So we thought her yard would work. But she's doing a major landscaping project this year, and the disruption would not be good (especially for the workers! ), so her yard was out. We put the call out through the Pikes Peak Beekeepers Association, and when they emailed us with info we jumped on it. A local man didn't want to set up a hive himself, but was willing to have someone keep a beehive on his property. He has 2 acres in Falcon/Peyton area, and his neighbors seem excited about "the girls" pollinating THEIR gardens (oh, the irony). The plan is to put the second hive in Sarah's yard next year. We'll check the hive in about 5 days to make sure the queen made it out of her cage, the bees are building comb (since they were already starting to do this while in the package, I'm thinking they're gonna be good at this), and the queen is laying eggs. We'll take out more sugar water to refill the feeder, and hopefully my heart won't beat out of my chest this time. Doesn't matter how many times you tell yourself they aren't aggressive, they just want to eat sugar syrup and build a home, it seems that instincts still kick in when faced with stinging flying insects. Who knew? I think “The Schizophrenic Hobbyist” would have been an appropriate name, but My High Plains Life works. As I smile at your witty writing and view the photos of the new hive, all I can hear are events of the past replayed in my mind: Insert template for following scenarios “Danielle is at the emergency room with __________ (insert name). Apparently she ______________ (insert catastrophic life threatening event). The doctors say she will be fine, but she should never ___________ (insert repetition of catastrophic life threatening event) again. 1. Danielle is at the emergency room with your grandparents. Apparently she ate some antelope meat and went into anaphylactic shock. She has been advised against eating most wild game ever again. 2. Danielle is at the emergency room with Dad. She had an anaphylactic reaction to her allergy injections. No more allergy injections. 3. Danielle is at the emergency room getting sutures. Apparently there was an incident that involved a wedding, a lot of alcohol, and a swimming pool. It has been advised against combining the follow three together for her ever again. 4. Danielle is at the emergency room with Heather. Apparently she was “test riding a horse” and dislocated her elbow. DH says no more horses. There seems to be a theme here. BUT I love your exuberance for pursing hobbies that require large doses of antihistamines, epinephrine and hopefully NEVER endotracheal intubation. You must really love honey! I look forward to the adventures to come. Bees - the coolest bugs ever, and like you said, they can make food for HUMAN consumption while taking total care of themselves!